The first time I experienced shawarma I was a teenager and was with my parents in Israel for the wedding of a family friend. I was lying out by the pool at our hotel with one of the bride's maids and she ordered a snack from the poolside bar - a shawarma sandwich. Hers was made with lamb which I was still a little skittish about back then but the aroma was one of the best things I'd ever smelled. Back home in New York I was happy to find plenty of places that offered shawarma although, just as with falafel, quality varied greatly. Eventually I knew I had to learn to make it myself. Here's the thing about shawarma spice mix recipes. If you look up a dozen recipes you will, in fact, get a dozen different recipes. Some only differ in measurements while others introduce spices not commonly included. You can also buy pre-made shawarma mix from about half a dozen spice companies. They don't list their recipes but I'm willing to bet they all taste a little different. So, we're going to have to agree that it's one of those hometown, regional, tribal, family specific kinds of things and nobody is really sure what's correct. I time in my kitchen playing mad scientist with varying spices and quantities and the recipe below is the one I liked best. It sure smelled good when it was roasting so I kind of think I got it right. Most places I've found consider shawarma a sandwich and the meat (beef, lamb, chicken) is roasted on a spit with the spice. 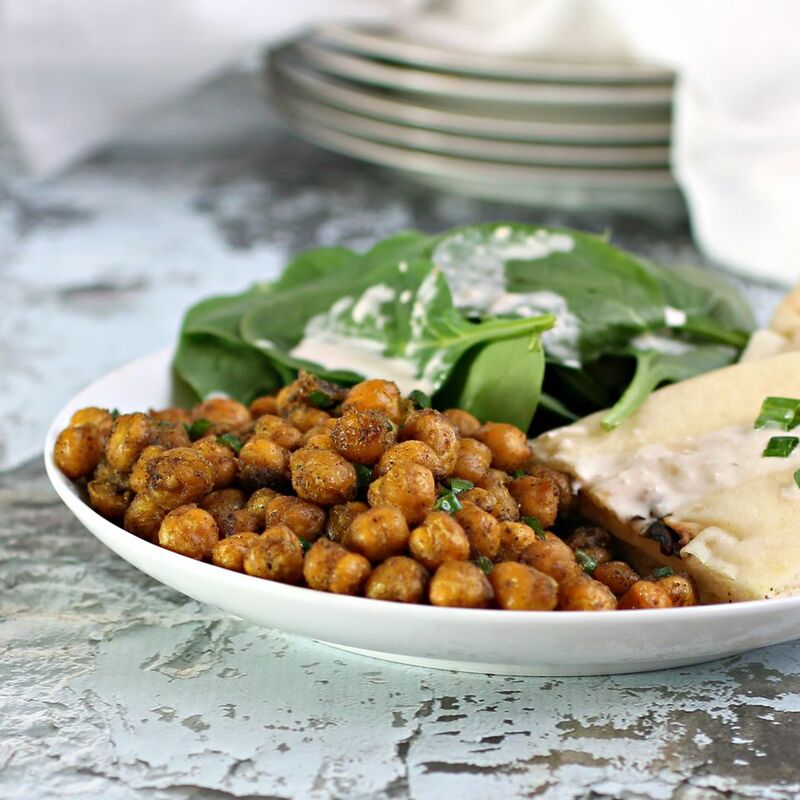 So chickpea shawarma is not as common but they just don't know what they're missing! To make the spice mix, combine all the spices in a small bowl. You'll have enough for this recipe, but I usually keep the same proportions but make a larger batch to have on hand. Spread out on a baking sheet lined with parchment paper and roast for 30 minutes. Toss with the chopped herbs. Serve on a bed of greens, over rice or in a pita sandwich with Israeli salad.